Forage: White Clover is the most important pasture legume. It is a highly palatable, nutritious forage for all classes of livestock. White clover is commonly planted with Orchardgrass, Ryegrass, or Tall Fescue. ‘Ladino’ grows tall enough to be harvested for hay, silage, and green chop. Intermediate and small White Clovers seldom grow tall enough to be harvested for hay or silage. Beautification: White Clover is seeded at 2 pounds/acre with grass for stabilization on moist soils. On dry sites, it usually establishes only on wet or moist areas. Wildlife: White Clover is a choice food for deer and elk. Erosion control: Grass seedings benefit from the nitrogen produced by White Clover included in the seed mixture. Solid stands of White Clover form a good erosion controlling cover on moist fertile soils, but stands may be sparse or spotty on dry sites. Trifoliium repens, L., White Clover, is a perennial legume that originated in Europe and has become one of the most widely distributed legumes in the world. It has a prostrate, stolonifer-ous growth habit. The leaves are composed of three leaflets, which may or may not have a “cresent” or “water mark” on the upper surface. Leaves and roots develop along the stolon at the nodes. The three general types of White Clover usually recognized are (1) large, (2) intermediate, and (3) small. The flower heads, each consisting of 40 to 100 florets, are borne on long stalks from the leaf axils. Florets are white but may have a pink hue. There are approximately 768,000 seeds/ pound. White Clover thrives best in a cool, moist climate on soils with ample lime, phosphate, and potash. 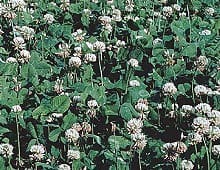 In general, White Clover is best adapted to clay and silt soils in humid and irrigated areas. It grows successfully on sandy soils with a high water table or irrigated droughty soils when adequately fertilized. White Clover seldom roots deeper than 2 feet, which makes it adapted to shallow soils when adequate moisture is available. The standard seeding rate is 2 to 4 pounds/acre, planted at a depth of 1/4 to 1/2 inch. For pasture establishment, seeds are drilled into a well-prepared seedbed that has been plowed, harrowed, and compacted to produce a firm seedbed. The seeds are inoculated before seeding. For stabilization use, seeds are broadcast on roadside cuts and fills by cyclone seeders hydroseeders, or blower-type equipment. The proper time of seeding is determined by seasonal and moisture conditions. This may vary from April to May. Late summer and fall seedings should be conducted while adequate moisture is still in the soil to assure establishment before freezing. Management for forage is aimed at maintaining 40% to 50% clover. Close grazing (2 inch stubble height) favors clover, whereas light grazing favors grass. Well-fetilized grass will outgrow clover in fall and winter and could smother the clover. Spring applications of nitrogen will stimulate grass and provide early feed, but excessive rates are detrimental to the clover stand. Phosphate applications are broadcast in fall or spring according to soil tests. Sulfur, boron, or magnesium may be needed for maximum production on some soils in the western part of White Clover’s range.